Two’s company, [is] three a crowd? This thread started when carppuzzle saw someone selling one Delkin on Trackle-trader. Why one, down sizing from three to two rods perhaps? And where does this sit on the carpy scale? Three seems to be the norm, and the instagram pictures prove this but there are plenty of doubles, plus double set ups with a third rod on a bankstick off at a jaunty angle. Thinking back to an old Terry Hearn article in Carpology about rods, spots and positioning, he concluded that you know the best spot, “that’s the last one you wind in at the end of a session”, so what are the other rods doing? Number two is often either side of number one to catch that wary carp that often hangs back on its approach to the baited area. Now you could put the third opposite the second but often there is one main route into the baited area (due to snags, weed, gravel bars, and observed carp habits) therefore, more often than not the third is flung out into the lake with a pop-up on the end or dropped in the margin. Back with Terry and now playing the percentage game, you would hope for 70% of bites on rod one, 25% on two. and less than 5% on three. 95% over two rods, as a betting man the third is a long shot at best and in my view redundant. 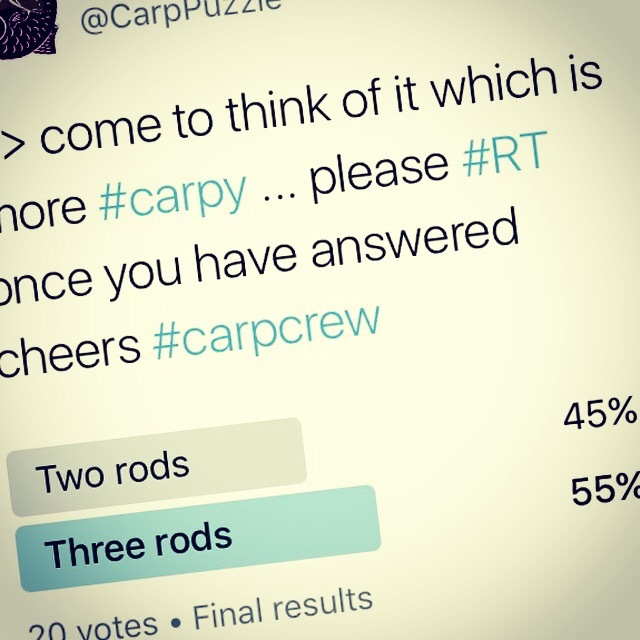 People often argue the third rod is reserved for showing fish, but why not use rod two? The odds are still in your favour with the prime rod, rod one on the chosen spot. Next is mobility, less on the barrow, quicker to set up and break down; logic says two is better but there is not much in it. Then cost, it’s not just the rod; add in the reel, line and terminal gear and despite tackle shop deals a three rod set up is the pricey option for the novice. And finally aesthetics, personally two is balanced, symmetrical and less cluttered. But I am sure plenty will disagree, that’s carp life. Having said all that, last year I bought a pair of Sonik S3’s (Big Butts) so now have four rods in the armoury, if need be I can upset my carpy karma and drop a third in the margin or sling a pop-up at whoever pokes their nose out of the water. So to be in pole position this winter I’ll stick with two, but never say never!